On behalf of Admin of JML Law, A Professional Law Corporation posted in Brain Injury on Saturday, Oct 27 2018. A brain injury is no joke. While the lucky ones experience very few, if any, symptoms and complications after damaging their brain in an accident, others have to live with significant limitations and impediments for the rest of their life. Yes, brain injuries can be very unpredictable, as they can change your life in one instance. Just yesterday, you were thinking about your promising career and how awesome it feels to be playing soccer with your kids. And the next day, after a catastrophic accident in which you sustained a head injury, your doctor tells you that you will be permanently disabled as a result of the brain damage. Just like that, in the blink of an eye, you no longer have a promising career and may never play with your children again because of the limited ability to use your body. And, as if this was not enough to turn your life into a complete mess, you are dealing with emotional changes caused by the brain injury. “It is not uncommon for patients diagnosed with head trauma after a car accident or other type of accident to develop behavioral and emotional problems that impact every aspect of their lives,” says our Los Angeles brain injury attorney at JML Law. Those diagnosed with brain injuries can develop a wide variety of behavioral and emotional changes, which can severely impact the quality and standard of their lives as well as their ability to work, speak, move, see, hear, smell, and even think. Besides affecting the above-mentioned abilities and functions, brain injuries can also impact how a person feels, acts, and expresses himself or herself. 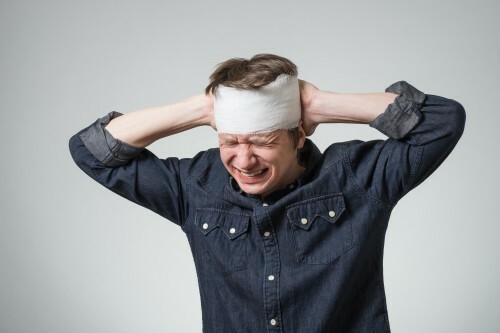 “It is not uncommon for those who were calm prior to the injury to become agitated and anxious due to the brain injury,” says our experienced brain injury attorney in Los Angeles. Those who used to be joyful and happy before the injury can become depressed and suicidal after a brain injury. Everyone reacts differently to brain injuries, and some people develop serious emotional changes that make it impossible to control their thoughts and/or mood swings. Just because you are feeling fine after an accident, it does not necessarily mean that you will not develop emotional or behavioral changes later on. It often happens that patients diagnosed with brain injury or head trauma manifest these changes days or even weeks after the traumatic event. If you have been injured in a car or truck accident – or any other accident, for that matter – it is paramount that you undergo a thorough medical evaluation to determine the severity of your injury. Even if you feel completely fine and there is not a single scratch or bruise on your head, it does not necessarily mean that you do not have a brain injury. Lack of motivation or initiative. Such emotional and behavioral changes after a brain injury can severely impact a person’s social and family life, as well as have a negative impact on his or her ability to work and earning capacity. The sooner you begin your treatment, the bigger the chance that your emotional changes will stabilize and improve within the first few months of recovery. It can be tremendously difficult to pay for the brain injury treatment out of your own pocket, which is why it is important to file a personal injury lawsuit against the party(s) responsible for your injury to recover damages. Speak to our Los Angeles brain injury attorney and get a free consultation by calling at 818-610-8800.